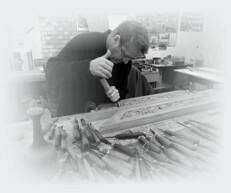 Welcome to Robert Lewis Woodcarving. Robert Lewis started working for himself as a wood carver in1981. Nearly 3 decades later, his wood carving work can be seen in such landmark establishments as Downing Street, Windsor Castle Globe Theatre and abroad. memorial to major restoration work.